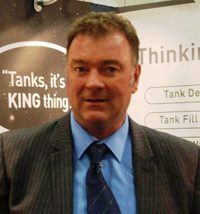 Based at Droylsden near Manchester, King Tanktechnic has 22 years of experience in tank lining and coatings which ensure the safe storage of millions of litres of hydrocarbons among many other substances. Having lined a flat bottom tank how does an operator check the status of its steel floor? With a double tank lining system, the tank is being continuously checked by the system’s constant monitoring. Ours is a continuous vacuum with an audible and visual alarm. How does an operator know a double skin lined tank is sound? If there is a perforation, the lining system’s audible and visual alarm will sound. When the alarms sound does this mean the lining has failed? No, it means the lining has worked correctly and detected a loss of vacuum, alerting the operator to a problem whilst keeping the tank’s contents contained. If necessary, this gives time to remove the contents and source the reason for the alarm. The double skin system is designed to contain product while the alarm source is identified. From experience the alarm is rarely raised; when it does happen it’s usually as a result of interference to the system and not failure of the tank/lining system itself. Can a new tank be lined? Yes, there’s no reason why not, prevention is better than cure. The lining material is resistant to corrosion therefore with the lining in place the steel is as good as when we lined it – if not better – as once the tank bottom is lined the steel interior surface is protected from further corrosion. A newly lined tank bottom is at no risk of corrosion from the tank contents at its internal surface. See also page 18.